Hoaward G. Goldberg wrote in the June 11, 2006 New York Times, "The 2005 Treleaven dry riesling from King Ferry Winery, on the eastern shore of Cayuga Lake, shows why Finger Lakes riesling has become internationally famous." Howard went on to say, "Light, exuding peach and apricot aromas and flavors and low in alcohol (10.9 percent), this white resembles fine counterparts from the Mosel region of Germany." Howard G. Goldberg wrote in the June 11, 2006 New York Times, "Bruce and Christiane Schneider are selling their Roanoke Point Vineyard and popular Potato Barn label but will continue to make small quantities of cabernet franc and syrah wine under their Schneider Vineyards brand." Accoding to Goldberg, "Mr. Schneider said last week that he intended to devote more time to his wine-marketing consulting practice at RF/Binder Partners in New York City, where he is involved with Wines of Germany and Wines of Chile, both clients." "For 12 years, Christiane and I have worked other full-time jobs in addition to running Schneider Vineyards," he said. "Our daughter is now 4, and we want to have more free time for our family." The sale of the Potato Barn label and the 21-acre vineyard property, at 2248 Roanoke Avenue in Riverhead, where 14.5 acres are planted to red grapes, is being handled by Brown Harris Stevens in Cutchogue. The total asking price is $1.8 million. The site contains a potato barn, which could become a winery, as have other such barns. The vineyard can yield about 2,500 cases of wine, with 500 more possible from added plantings, Mr. Schneider said. "Although several East End producers farm cabernet franc, a relative of cabernet sauvignon, the Schneiders have been perhaps the most conspicuous champions of the wine. They have maintained that it has a more promising future locally than merlot, the region's signature red," Goldberg continued. Anyone want to front me a winery? Truly, two of the pioneers of the Hudson River Valley are leaving center stage!!! "In 1965 George W. Naumburg, Jr., M.D. and his wife Michelle planted their first vines. Michelle came from Julliard and the Broadway stage with a detour through serious cooking. Her contributions are evident where ever you look and taste. Although grapes were new to him, George grew up on a farm in Northern Westchester. That experience plus his knowledge of chemistry and bacteriology gave him a good start on managing a vineyard and making wine. After growing 36 varieties of wine grapes to learn which could grow well and yield the best wine at this site, all but Seyval Blanc, Foch, de Chaunac and Chancellor were removed in 1979 when North Salem Vineyards became a commercial opertion," wrote The Journal News. "The winery had been a modern Dairy Barn quite unlike the more traditional dairy barns in the region. We re-built it in 1983 to provide a more dramatic, modern tasting room with space for indoor events. The remainder of the building holds stainless steel tanks, winemaking equipment, a laboratory, workspace for bottling and labeling and a temperature controlled room in which to store bottled wine." When North Salem Vineyard hosts the 11th annual Hudson Valley Wine and Food Festival on Aug. 12 and 13, it will be the vineyard's last. Owner George W. Naumburg, Jr. and his wife, Michelle, are retiring after this harvest. By happenstance, most of the vines have reached the end of their useful lives, Naumburg says. "We'll get one more harvest out of them." Besides the harvest, Naumburg and his wife have other work to do before they call it quits: They need to sell more than 2,000 cases of wine. Call the winery, or visit at the festival, which, for $15, gets you a glass to taste more than a dozen Hudson River wineries, including: Alison Wines and Vines, Applewood Vineyards, Baldwin Vineyards, Benmarl Wine Co., Brimstone Hill Vineyard, Brotherhood Winery, Cascade Mountain Winery and Restaurant, Glorie Farm Winery, Millbrook Vineyards, Pazdar Vineyards, Warwick Valley Vineyards and Whitecliff Vineyards. The festival will also showcase produce from several farms and food from local restaurants, including The Fish Cellar in Mount Kisco and Jaipore Restaurant in Brewster." In 1965 George W. Naumburg, Jr., M.D. and his wife Michelle planted their first vines. Michelle came from Julliard and the Broadway stage with a detour through serious cooking. Her contributions are evident where ever you look and taste. Although grapes were new to him, George grew up on a farm in Northern Westchester. That experience plus his knowledge of chemistry and bacteriology gave him a good start on managing a vineyard and making wine. After growing 36 varieties of wine grapes to learn which could grow well and yield the best wine at this site, all but Seyval Blanc, Foch, de Chaunac and Chancellor were removed in 1979 when North Salem Vineyards became a commercial opertion." We will visit them again before the barn doors are shut...but for now, better get in while the gettin' is good. The winery had been a modern Dairy Barn quite unlike the more traditional dairy barns in the region. We re-built it in 1983 to provide a more dramatic, modern tasting room with space for indoor events. The remainder of the building holds stainless steel tanks, winemaking equipment, a laboratory, workspace for bottling and labeling and a temperature controlled room in which to store bottled wine. Wine Compass.com is a wonderful, all-purose wine website that can keep you informed about east coast wineries and wine events. It's smart, well thought out and a generally wonderful website deisned to be easy to use and easy on the eyes. I am a big fan of Todd's wine page. This directory is a free service that allows users to search for wineries, wines, and events by state as well as add wine reviews and shop for wine products. Read all about the Pennsylvania laws and the Governor from the Philadelphia Inquirer. Residents would be allowed to buy bottles from out-of-state wineries, but they would have to pay 18% "Johnstown" tax. A proposal by Gov. Rendell would allow Pennsylvania residents to legally order wine directly from most out-of-state wineries, as they've been able to do from Pennsylvania wineries for years. The rub is that all wineries would have to charge the state's 18 percent "emergency" tax on those shipments. Consumers now pay the so-called Johnstown tax - imposed to help rebuild that city after a 1936 flood and never rescinded - on purchases at State Stores, but not on wine shipped directly from Pennsylvania wineries. Rendell expressed confidence in an interview yesterday that his proposal would pass legislative muster. "It's clear that the financial impact on us will be limited, and it's clear that this will be plus for Pennsylvania consumers," he said. But consumers may still have months to wait before the issue is settled. The Republican and Democratic leaders of the House Liquor Control and the Senate Law and Justice Committees, which oversee the state's alcoholic beverage laws, met yesterday for the first time to discuss Rendell's proposal, said Dave Thomas, executive director of the House committee. Because the legislature remains busy with property-tax and budget negotiations, Thomas said he doubted that legislation on direct wine shipments would be done until fall. Rendell's draft legislation is a response to a U.S. Supreme Court ruling in May 2005 that a state may not allow its own wineries to ship directly to consumers if it prohibits out-of-state wineries from doing so. Backed by that ruling, a Philadelphia-based federal judge in November ordered Pennsylvania authorities to stop enforcing laws that prohibit out-of-state wineries from shipping wine directly to Pennsylvanians. Since the May 2005 Supreme Court decision, the number of legal direct-shipping states has increased to 33 from 25, according to Free the Grapes!, a coalition pushing for open wine shipments. For the owners of Pennsylvania's 112 wineries, Rendell's proposal is generally positive. Some feared that the state would ban all direct shipments and restrict Pennsylvania wineries in ways to comply with the ruling. "I'm glad to see they are trying to be reasonable," said John Kramb, owner of Adams County Winery and president of the Pennsylvania Wine Association. Mention grape stomping, and images of Lucille Ball up to her knees in grape juice pop into my head. Apparently, I'm not the only one who associates the two. "Come on Lucy!" cried one man as Joe Martucci of Hackensack removed his socks and stepped into a small wooden tub that held bunches of red grapes, still on their stems. Martucci was the first to take the plunge at the Barefoot Grape Stompin' event at Four Sisters Winery in Warren County. The rest of us waited to see his reaction. When his feet emerged stained with very little purple, others deemed it safe enough to try. When my turn rolled around, I gathered my skirt and began hopping around the wooden tub, knees high and toes squishing, trying to imitate the scowling Italian woman who shared the tub of grapes with Lucy. This was a bad idea. I felt my feet slipping, and I pictured myself losing my balance and falling backwards onto the edge of the tub and then the concrete slab beneath it. Given my history of tripping on stairs and falling off bikes, I chose the tamer route of lifting my feet just a few inches before returning them carefully to the grapes. "I'm happy we don't have to do this for a living, because it's not easy," said Craig Hosbach, the resident winemaker. And he was right. We stomped and stomped, yet we made little progress. According to Hosbach, each of the 20 attendees would have had to stomp vigorously for two minutes to squeeze all the juice from just those few bunches of grapes. I had a few questions I'd meant to ask, even before I set foot on the winery: Back when grapes were actually crushed this way, what happened when feet (generally not the cleanest of body parts) are less than sterile? Are stompers' feet inspected prior to a session with the grapes? The answer both reassures and turns the stomach. "Fermentation kills everything, so it's okay if you happen to have some weird fungus on your feet," Hosbach said. "Nothing can survive in an 11-percent alcohol environment." Alcohol or no alcohol, I'd still want fungus-free grape stompers making my wine. Luckily, grape stomping events nowadays are mostly nostalgic affairs, traditionally held to celebrate the harvest. The grapes that eventually become wine are poured into large metal contraptions that de-stem, seed and crush all at once. Valerie Tishuk, the president and events coordinator of Four Sisters Winery, said the winery has been hosting grape-stomping events for more than 20 years. In the summer, $45 buys a visitor lunch, a wine-tasting seminar and a tour of the vineyard and production area. In the fall, visitors are invited, for free, to stomp a few of the grapes harvested from the vineyard after sampling wines. "It's a little bit of nostalgia for people. It's how wine was crushed years ago," she said, adding that many want to re-enact the scene from that memorable "I Love Lucy" episode. The Four Sisters Winery opened in 1984, three years after Robert "Matty" Mattarazzo planted grapes on his 250-acre farm in Belvidere, just a few miles from the Pennsylvania border. He and his wife hoped the winery would eventually pay for their four daughters' educations. We learned during lunch that the youngest just received her degree. That sure sounded like success to me. They still grow some fruits, vegetables and flowers, but they've devoted most of their efforts to the wines: 10,000 gallons each year of reds, whites, fruit wines, roses, port and a sparkling wine. They're made from Niagara grapes, which are native to the area, and French-American hybrids, which grew better than the vinifera grapes popular in California. The wines flowed during lunch, as Tishuk circled the room, filling glasses with a different wine every few minutes. We learned to swirl, smell, sip, swish and spit, in that order. We sniffed bouquets and looked for "legs" in the wine, the bits of liquid that streak down the side of the glass following a good swishing. My tablemates and I happily skipped the last step in the tasting process, the spitting, and downed each wine before the next round came, until we feared risking serious intoxication. Some we liked, others not so well. We were about to write off a chambourcin until Tishuk suggested tasting it after a few bites of food. Murmurs of surprise floated around the room, as diners sipped what tasted like a different wine. Not everyone, however, was pleased. "I don't like this one, no matter what I eat," said Clarke DeBlasio, of Califon, pouring his serving into the spit cup at the center of the table. Hosbach, the winemaker, led the tour through the process of making those wines, from the grapes on the vine -- which, at this time of year, are about pinhead size -- to the large vats of fermenting juice. While we stomped grapes, he mentioned that he's just 27 years old. After a bit of prying, I learned that he's a computer science major who decided to take a beginner's winemaking course at a vineyard in Virginia before apprenticing at Four Sisters. Mostly, he's learned on the job, through trial and error. We pestered him with questions, amazed that someone could learn so quickly how to produce good wines. I made sure to get the name of that winery in Virginia. Four Sisters Winery is holding two more grape stomping events this summer, on July 7 and July 22, from 7 p.m. until 9:30 p.m. Tickets are $45 per person plus tax, and they include wine tasting, a wine-cellar tour, a buffet-style dinner, and, of course, grape stomping. For more information, call the winery at 908-475-3671. The Four Sisters Winery is located at 783 County Route 519 in Belvidere, just six miles north of Interstate 80 exit 12. Reach Carolina Bolado at 973-569-7066 or bolado@northjersey.com. “O h, L u c y!” Now, Open-to-the-Public! 7-9:30pm - If you’ve ever seen that famous “I Love Lucy” episode with Lucy stomping grapes, here’s your chance to actually experience it . . . Roll up your pants… and take off your shoes and socks! Willing guests will have the opportunity to experience the old-fashioned way of crushing grapes. Wine tasting, hot/cold buffet, wine cellar tour and “Barefoot Grape Stomping”. It’s barrels of fun and an experience to remember! $45 per person, plus tax. Reservations and full payment is required. It’s the classic case of “Who Done It? !” Attend Four Sisters Winery’s Murder Mystery Dinner for a night of suspense. Guided by clues throughout dinner, your character will role-play and try to solve the case. To make your detective’s journey even more enjoyable, dine on tasty food and extraordinary wines. $45 per person, plus tax. Reservations and full payment are required. Open-to-the-Public! 7- 9:30pm Have a grape stomping’ good time! It’s the barefoot massage of a lifetime with a formal wine tasting, hot/cold buffet wine cellar tour and “Barefoot Grape Stomping”. It’s an experience to remember and barrels of fun! Cost: $45 per person, plus tax. Reservations and full payment is required. Come one, come all to Family Fun Day at Four Sisters Winery and Matarazzo Farms held on August 5 & 6. A day on the farm incorporates tractor-drawn hayrides, corn maze, wine tasting, vineyard and wine cellar tours, barefoot grape stomping, candy in the haystack, watermelon seed spitting contest, fresh-from-the-oven, pies, cookies and muffins. Live Music! Food at additional cost at our tent and in the market area. The cost is $7 ages 21+; $4 ages 11—20; 10 and under are FREE. Includes all activities except food and wine. Another fun cider you should try and find is West County Cider from Massachusetts. It's worth the effort. The Maloney family –Terry, Judith, and Field— began making hard cider commercially in l984. They’d been making cider for themselves and their friends for years before that. They grow much of the produce that appears on their table. It makes sense to them to ferment cider from the apples of these hills. They moved to the Northern Berkshires from Northern California in l972. This was Apple Country, not Grape Country. They didn’t find grapes for their year’s supply of wine, but instead they found a living, pleasurable tradition. The Maloney family from Colrain, Mass, offers the lightest, cheerful bottled hard cider-the very thing to drink with dinner... To appreciate the subtle location in the musical scale of the mouth of the taste of this hard cider from West County Hard Cider, first rid your taste buds of the things it is not. It is not dark, swilly and robust like regular cider (however good), nor does it have that slightly frustrating neither here nor there quality of a wine cooler. It's not wine of course, though there's a distant cousinship-pingponging from grape to apple-between the lightest of light white wine and this bubbly hard cider, which has less than half the alcohol (from four to six percent), a difference you can pleasantly appreciate when you can still read a book after dinner. This family winery, in business since l984, uses local apples (not from concentrate!) blending bittersharp and bittersweet ones with sharps like northern spy and sweets like red delicious. Too bad it must be called 'hard' because if anything it tastes and makes you feel easygoing. Also too bad the word 'refreshing' has been overused by tinny tacky soft drinks, because it well applies. It's an Emma Thompson of a drink, both modest and bracing. Bottled (no six packs) and capped, this cider goes very well, unobtrusively, indeed enhancingly, with food. It comes in 'bone-dry'to sweet-and even that is restrained-and can be found at DeLuca's, Martighetti, Hi-Rise Bread Company-and on tap at the Plough and Stars." "The temptation is to compare these ciders to a white wine. They have a similar complexity, though the alcohol content is consistently lower (4% to 7.5% by volume, compared with 8% to 14% for wine). Ultimately, though, this comparison is misleading. In hard-cider tastings, wine connoisseurs may find themselves at a loss for words; the vocabulary used to describe wine doesn't quite apply. These ciders, in short, must be appreciated in their own right. They are American classics, and their only equals belong to another age." I went for a walk at lunch time this afternoon and decided to stop by McAdams Buy Rite Liquors and found a bottle of the Channing Daughters Tropical Chardonnay. I was alone this evening, the wife, the kids and the dogs all away. Just me and the television and a bottle of chilled Chardonnay. Instead of watching tv, I wandered out onto the porch. All alone, I must admitt I was looking forward to the peace and quiet. I stood on the deck behind the house and relaxed as a warm breeze swept over the back yard. It was the 20th of June, one of the longest days of the year, and the sun was still out even after a long commute home from the city. I looked around our deck, a little worse for wear. Some of the stain needed touching up and some of the grass needed trimming along the brick pathway. My kids' swing set needed some repairs, and their bikes and skate boards dotted the lawn. I should use the moment to paint or clean up or repair. But I looked up at the late summer sky knowing that the longest days of the year were mostly behind me, and listened as the gentle summer breeze rustled the trees. My guilt over letting go of some of these responsibilites was replaced by a desire to enjoy the moment. And that's when I uncorked the wine. The wine exploded with with pineapple, honeydew melon, apples, and citrus flavors. According to Channing Daughters, itt was created almost entirely in a stainless steel tank with a small portion (10%) fermented wild on its own indigenous yeasts in two new French oak barriques (225L). 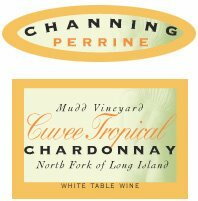 All of the fruit was hand-harvested from the Mudd Vineyard on the North Fork and the wine is made from 100% Musque clone Chardonnay. Gently pressed in clusters and bottled by gravity on February 1, 2006. I love my fmily, and I certainly missed them, but it's been a long time since I had this quiet a eveing. Was it the warm summer breeze? The sound of the trees waving back and forth as the fireflies slowly emerged as the sun began to set? Maybe....maybe not. But let me tell you this....I love this chardonnay. It is fabulous and you will love it too. Chill a bottle and open it on your back porch. Dominique and I were in upstate New York last weekend, working hard outside in the fields of our new country home. The day was getting long and hard, and the tempeature was ising. The sun was rising higher and hotter. And the air was thickening with a slowly increasing humidity. And we were exhausted. 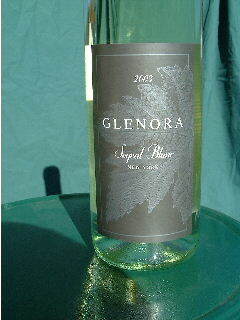 Inside, waitng for us was an icy cold bottle of Glenora Seyval Blanc. When we came in, to cool off, we doused ourselves with cool water and washed up, cut up som cheese and grabbed some glasses. We parked ourselves in the open livingroom, with dueling ocillating fans, and uncorked the sweating bottle. Located on the tumbling western shore of New York's Seneca Lake, Glenora Wine Cellars was founded in 1977 shortly after the passage of New York's Farm Winery Bill. Glenora expanded and refined it's product line, Glenora had, by the end of its first decade, grown from a farm winery to a commercial producer. Glenora has grown from an annual production of 5,000 cases to 40,000 in recent years. In 1987, the winery under took a major expansion to accommodate increased production of top quality champagnes and premium table wines. And now here we were, with our feet up on the coffee table, ready to put the day behind us. We were exhausted. The wine was cool and soothing. Vanilla and spices came through as advertised. It had wonderful citrus overtones. It was like a wonderful Sauvignon Blanc. Fabulous. One of the nicest Seyval Blancs we have ever had. It's a wonderful wine, worthy of the Austalian and California Sauvignon Blancs and Itlian Pinot Grigios. Lemony and lipsmacking. So try some a cool off as summer heats up. I have been hankering to get to Silver Decoy Winery in Hightstown for quite some time. Unfortunately, they were a fledgling winery when I was doing the research for my vineyards book, and my editor at Rutgers told me I could not include another winery, my book was already 12 months late at that point. The problem however, is that the east coast winery industry is one of the fastest growing regions in America, if not by quantity of wine produced, at least by the number of boutique, hand-crafted wineries. For months I have been trying to persuade my wife, in our few spare minutes, to take a ride with me across Route 33 from Freehold, to at least see this little, new winery and to taste their wares. She has been exhausted of late with a new home we are planning, and her work and the boys and the dogs, and the answer had been no, 10 times over. So a couple of Saturdays just past, I told Dominique I would go without her, but that I was going. She happily bid me a fond adieu and I was off. Nestled in the rolling terrain of Mercer County, New Jersey, Silver Decoy Winery was founded in 2001 to create high quality wines that celebrate the Garden State. At Silver Decoy, they believe the unique terroir of central New Jersey produces grapes with distinct flavor characteristics capable of making exciting wines. Silver Decoy Winery is run by seven partners who shared the vision of becoming a premier producer of estate-grown wines in New Jersey. “What started out as a hobby quickly turned into a business as we realized the demand for high-quality locally grown wines in the state<“ claims the wineries’ website. “Our partners bring together over 50 years of experience in the wine industry and over 30 years of expertise in agriculture.” The partners include: Todd Abrahams, Brian Carduner, Mark Carduner, Russell Forman, Richard McIntyre, William Perrine, and Jerry Watlington. Each partner brings a different skill set and passion that makes the sum total greater than the individual parts. I happen to drive up during a rainy Saturday, following the signs to the tasting room. It was confusing, however, because all I found were the partners bottling. They were bottling their newest blush. Mark Cardner, the ring-leader of this motley crew of vintners stuck out his hand and greeted me. “I’m looking for the tasting room?” I asked. “You’re in it. Sorry, we’re bottling. Can I pour you something?” he said with an easy, confident smile. For 25 years he owned and managed Carduner's Fine Wines & Spirits of East Windsor, New Jersey. His knowledge of wines and friendly personality made the store a destination place for wine enthusiasts across the Eastern seaboard. I bought my first Talbot Chardonnay from him, and many more wines, as well as many specialty beers. While he had waited on me in a very professional manor, despite my love of wine, the patterns of where I bought wine changed because I left near-by McGraw-Hill (their Hightstown offices) and went to work in Philadelphia. Now here I was. Our conversation was vibrant, and his face lit up the more we talked about wine.I tasted the Trimanette first. Outstanding. Lots of fruit up front, but nice acidity saves this from being cloying. Far be it, it’s fun, light wine, great for summer sipping, and will go fabulously with seafood as well as salads and cheeses. Next I had their Chardonnay, which is a blend of stainless steel fermented wine and wine left in oak for some amount of time. there are wonderful fruity aromas up front, but a smooth finish, with a hint of oak, vanilla, and a nice creaminess. Very nice. I then asked to try the blush. He pulled a bottle that had not yet been corked straight from the bottling line with the swashbuckling confidence of a musketeer, though the boys in the bottling line gave him a corkscrew sideways glance. The gallant gesture was not lost on me. Their blush is a Cayuga that is tinged with dry Foch and Chancllor red wines. The result is a fruity but not too sweet blush that is wonderful. There’s plenty of fruit for those seeking their sugar-like fix, but the wine is light, and the residual sugar is actually minimal. It’s a refreshing, off-dry wine, light and delicious. Next I had the Retriever, named after the winery mascot, a chocolate lab, which is made from California grapes, which includes Cabernet Sauvignon and Barbera. While they say drink now through 2009, I actually think it will be fine well beyond 2009. I bought a bottle or two and immediately laid it down in the cellar. I’ll pull it out in thre or four years and decant it to make sure I get all the flavors I can out of it with a nice charcoaled New York Strip or a nice sirloin. Now, here’s where the biggest surprise took place. I began to taste their reds. And I was shocked. One after another were fabulous. Let’s start with the Cabernet Franc. It was big, dark and purple. And the nose was wonderful. And then I tasted. And their was what I would later come to understand as the signature style of Silver Decoy. Silver Decoy is a red lovers’ dream. The fruits were all there. Big bright and dark cherries. Hints of chocolate and vanilla came through. And a nice soft finish. Excellent. The Merlot was like a bright bowl of cherries with some darker berries as well. Hints of vanilla, and a smooth finish. A nice dry red. The Chambourcin was also very nice. A little darker wine and a darker berry came through. A very nice Chambourcin, and very drinkable. Then came the KC-10 Select Marechal Foch. Honoring the flyers of the KC-10 of McGuire AFB, this quiet wine has a lot to say. The nose is big and fruity. I caught thes subtle anise and bing cherry. And the slight vanilla overtones brought on by the oak.. It’s picy and msooth, with a lovely dry finish. All in all, the best reds in the state of New Jersey, and one of the best red wine makers I’ve tasted in a long while. There is tremendous promise here. The Foch was easily the best Foch I have ever tasted, and instantly becomes one of the best on the east coast. And the cabernet franc was every bit as good as Millbrook’s, or my favorite reds from Long Island…and at a very affordable $17.00 a bottle. This stuff really compares with Bedell and Raphael and the rest for drinkable reds, they if you tasted them, you would never guess they were from New Jersey. Remember to include Sal Turdo's wines in that group too! But, wait, there’s more! Mark took me into the back, and I tasted the 2005 wines. The 2005 Merlot, traight from the barrel is sure to make Kip Bedell blush with jealousy. It’s smooth bright cherry flavor melt in your mouth to a fine smooth vanilla. Absolutely fabulous. The 2005 Cabernet Franc was incredible, with dark, jammy plum flavors and a hint of oak, with a nice dry finish. And the 2005 Foch ws a glorious discovery. Big and jammy, like a giant plum pudding, with enough chocolate and vanilla to ground it’s tannins and give it a nice, dry finish. And they have a pair of lovely dessert wines. A light raspberry and blueberry. Light wines, with just a hint of sugar, made for those who want to participate in the dessert experience, but are tuned off by wines way to sweet for your palette. Mark and I became fast friends, discussing other winemakers we knew in common. Mark is the winemaker at Silver Decoy, but once you see the vineyards, as he is quick to tell you, he gets a lot of help from his friends. Their goal is to leave half the fruit on the vineyard floor by July, and each vine will get touched a minimum of ten times throughout the summer. The rows are impeccably kept, and you begin to realize what the other players bring to this venture. You have never seen more well cared for vines. They re trimmed and stripped, the dirt is maintained in neat rows and the grass is cut almost to putting green length to keep the insect quotient to a minimum. You see where the other even put their effort in. The field…and of course, the bottling line. I bought a bunch of wine to lay down, and I know I will be back for the 2005s.And long there after. Go there now, so you can say two and three years from now that you discovered them way back, when they were still small. Because if things keep going the way they are now, you won’t be able to say that for much longer. As a reality check, I opened a bottle of Silver Decoy two nights later. My skeptical wife, Dominique, giving me a corkscrewed look, as I effusively blabbed on and on about Silver Decoy. I had not stopped chatting about them. But even her disbelief was dispelled by a few sips of these wonderful dark red elixirs. And my review was confirmed. Of course, being a wife, she wouldn’t tell me I was right. But her hurried request for another greedy glass gave her away. Paul and Warren host a great new wine blog devoted to Virginia Wine, called Virginia Wine Time. It's an excellent wine blog, and should not be missed. On Memorial Day we went to the Bishop's Garden at the National Cathedral. While we weren't visiting a Virginia winery, we were enjoying a Virginia wine. With us we brought a 2005 Vidal Blanc from Gray Ghost. The Vidal Blanc has a clear, pale yellow complexion; it possesses citrus and pear aromas. On the palate, citrus and melon flavors prevail with subtle hints of peach. It has a tart, crisp finish---somewhat sweet, but not overwhelmingly so. This Vidal Blanc has already won numerous awards including Best in Class at the 2006 LA County Fair International Wine Competition, and it is destined to be a crowd pleaser this summer. It's a lovely appertif and pairs nicely with spicy mango salsa; other spicy dishes would also be complementary. Feel adventurous and dare to pair this one with blue cheese! On this particularly warm day, the Vidal Blanc was a perfect companion for our picnic. Fresh mango, strawberries, and light cheeses matched quite well; spicy ham sandwiches on baguettes seasoned with olive oil, cracked pepper, and Italian herbs likewise paired very well. A special mention of the buttery-soft St. Andre cheese should be made; this cheese is a delight, and we brought it along to enjoy with the fruit and wine. 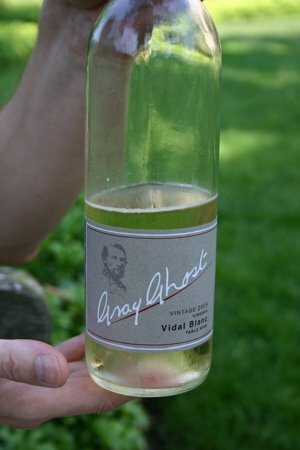 On this warm afternoon, the Gray Ghost 2005 Vidal Blanc was cool, crisp and refreshing.